IP sockets are the lowest level layer upon which high level internet protocols are built--every thing from HTTP, to SSL, to POP3, to Kerberos, to UDP-Time. To implement custom protocols, or to customize implementation of well-known protocols, a programmer needs a working knowledge of the basic socket infrastructure. A similar API is available in many languages; this tutorial uses C programming as a ubiquitous low-level language, and Python as a representative higher-level language for examples. Readers of the first part of this tutorial were introduced to the basics of programming custom network tools using the widespread and cross-platform Berkeley Sockets Interface. This tutorial picks up with further explanation of User Datagram Protocol (UDP), and continues with discussion of writing scalable socket servers. This tutorial is best suited for readers with a minimal level of knowledge of C and Python . However, readers who are not familiar with either programming language should be able to make it through with a bit of extra effort; most of the underlying concepts will apply equally to other programming languages, and calls will be quite similar in most high-level scripting languages like Ruby, Perl, TCL, etc. The next couple panels contain a quick recap of the discussion in part I of this tutorial--if you already read that, you can skip forward through the next few panels. 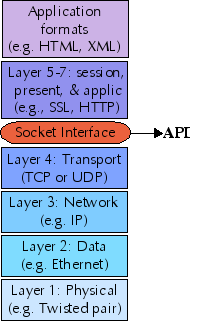 A computer network is composed of a number of "network layers" , each providing a different restriction and/or guarantee about the data at that layer. The protocols at each network layer generally have their own packet formats, headers, and layout. The seven traditional layers of a network are divided into two groups: upper layers and lower layers. The sockets interface provides a uniform API to the lower layers of a network, and allows you to implement upper layers within your sockets application. Further, application data formats may themselves constitute further layers. Sockets cannot be used to access lower (or higher) network layers; for example, a socket application does not know whether it is running over ethernet, token ring, 802.11b, or a dialup connection. Nor does the sockets pseudo-layer know anything about higher-level protocols like NFS, HTTP, FTP, and the like (except in the sense that you might yourself write a sockets application that implements those higher-level protocols). At times, the sockets interface is not your best choice for a network programming API. Many excellent libraries exist (in various languages) to use higher-level protocols directly, without having to worry about the details of sockets. While there is nothing wrong with writing you own SSH client, for example, there is not need to do so simply to let an application transfer data securely. Lower-level layers than those sockets address fall pretty much in the domain of device driver programming. UDP, on the other hand, does not require that any connection be established between client and server, it simply transmits a message between addresses. A nice feature of UDP is that its packets are self-delimiting--each datagram indicates exactly where it begins and ends. UDP, however, provides no guarantee that packets will arrive in-order, or even at all. Higher-level protocols built on top of UDP may, of course, provide handshaking and acknowledgements. A useful analogy for understanding the difference between TCP and UDP is the difference between a telephone call and posted letters. The telephone call is not active until the caller "rings" the receiver and the receiver picks up. On the other hand, when you send a letter, the post office starts delivery without any assurance the recipient exists, nor any strong guarantee about how long delivery will take. The recipient may receive various letters in a different order than they were sent, and the sender may receive mail interspersed in time with those she sends. Unlike with the USPS, undeliverable mail always goes to the dead letter office, and is not returned to sender. The above description is almost right, but it misses something. Most of the time when humans think about an internet host (peer), we do not remember a number like 64.41.64.172 , but instead a name like gnosis.cx . The first part of this tutorial demonstrated the use of DNS and local lookups to find IP addresses from domain names. As in the first part of this tutorial, my examples for both clients and servers will use one of the simplest possible applications: one that sends data and receives the exact same thing back. In fact, many machines run an "echo server" for debugging purposes; this is convenient for our initial client, since it can be used before we get to the server portion (assuming you have a machine with echod running). Readers of the first part of the tutorial have already seen a TCP echo client in detail. So let us jump into a similar client based on UDP istead. The various specialized SocketServer classes all require you to provide an appropriate .handle() method. But in the case of DatagramRequestHandler , you get convenient pseudo-files self.rfile and self.wfile to read and write, respectively, from the connecting client. "USAGE: %s <server> <word> <port>"
print "Failed to receive identical message"
If you happen to recall the TCP echo client from the first part, you will notice a few differences here. The socket created in this case is of type SOCK_DGRAM rather than SOCK_STREAM . But more interesting is the connectionless nature of UDP. Rather than make a connection and call the .send() and .recv() method repeatedly until the transmission is complete, for UDP we use just one .sendto() and one .recvfrom() to send and fetch a message (a datagram). There is something else interesting to notice in this client session. Of course, since I launched the server and client in the same terminal, the output of both are interspersed. But more interesting is the client_address that is echo'd. Each new connection establishes a new socket number (they could be reused, but the point is you do not know in advance). Port 7 is merely used to recognize the request to send a message, a new ad hoc socket is used for the actual data. The first few lines of our UDP client are identical to those for the TCP client. Mostly we just use some includes for socket functions, or other basic I/O functions. There is not too much to the setup. It is worth noticing that the buffer size we allocate is much larger than it was in the TCP version (but still finite in size). TCP can loop through the pending data, sending a bit more over an open socket on each loop. For this UDP version, we want a buffer that is large enough to hold the entire message, which we send in a single datagram (it can be smaller than 255, but not any larger). A small error function is also defined. At the very start of the main() function we allocate two sockaddr_in structures, a few integers to hold string sizes, another int for the socket handle, and a buffer to hold the returned string. After that, we check that the command-line arguments look mostly correct. A contrast with the Python code comes up already here. For this C client, you must use a dotted-quad IP address. In Python, all the socket module functions handle name resolution behind the scenes. If you wanted to do a lookup in the C client, you would need to program a DNS function--such as the one presented in the first part of this tutorial. In fact, it would not be a terrible idea to check that the IP address passed in as the server IP address really looks like a dotted-quad address. If you forgetfully pass in a named address, you will probably receive the somewhat misleading error: "Mismatch in number of sent bytes: No route to host" (see below for where this message is produced). Any named address amounts to the same thing as an unused or reserved IP address (which a simple pattern check could not rule out, of course). The arguments to the socket() call decide the type of socket: PF_INET just means it uses IP (which you always will); SOCK_DGRAM and IPPROTO_UDP go together for a UDP socket. In preparation for sending the message to echo, we populate the intended server's structure, using the command-line arguments. The value returned in the call to socket() is a socket handle is similar to a file handle; specifically, if the socket creation fails, it will return -1 rather than a positive numbered handle. Support functions inet_addr() and htons() (and atoi() ) are used to convert the string arguments into appropriate data structures. For what it does, this UDP client is a bit simpler than was the similar TCP echo client presented in the first part of this tutorial series. As we saw with the Python versions, sending a message is not based on first establishing a connection. You simply send it to a specified address using sendto() , rather than with send() on an established connection. Of course, this requires an extra couple arguments to indicate the intended server address. The error checking in this call usually establishes that a route to the server exists. This is the message raised if a named address is used by mistake, but it also occurs for valid-looking but unreachable IP addresses. The structure echoserver had been configured with an ad hoc port during the call to sendto() ; in turn, the echoclient structure gets similarly filled in with the call to recvfrom() . This lets us compare the two addresses--if some other server or port sends a datagram while we are waiting to receive the echo. We guard at least minimally against stray datagrams that do not interest us (we might have checked the .sin_port members also, to be completely certain). At the end of the process, we print out the datagram that came back, and close the socket. Even more than with TCP applications, UDP clients and servers are quite similar to each other. In essence, either one consists mainly of some sendto() and recvfrom() calls mixed together. The main difference for a server is simply that it usually puts its main body in an indefinite loop to keep serving. Again, not much is new in the UDP echo server's declarations and usage message. We need a socket structure for the server and client, and a few variables that will be used to verify transmission sizes; and, of course, the buffer to read and write the message. The first real difference between UDP client and server comes in the need to bind the socket on the server side. We saw this already with the Python example, and the situation is the same here. The server socket is not the actual socket the message is transmitted over; rather, it acts as a factory for an ad hoc socket which is configured in the recvfrom() call we will see soon. Readers will also notice that the echoserver structure is configured a bit differently. In order to allow connection on any IP address the server hosts, we use the special constant INADDR_ANY for the member .s_addr . The heavy lifting--such as it is--in the UDP sever is its main loop. Basically, we perpetually wait to receive a message in a recvfrom() call. When this happens, the echoclient structure is populated with relevant members for the connecting socket. We then use that structure in the subsequent sendto() call. And that's it! We can receive and send messages forever, reporting connections to the console as we go along. Of course, as we will see in the next section, this arrangement does only one thing at a time, which might be a problem for a server handling many clients (probably not for this simple echo server, but something more complicated might introduce poor latencies). The servers we have looked at--that do nothing but echo a message--can handle each client request extremely quickly. But more generally, we might expect servers to perform potentially lengthy actions like database lookups, accessing remote resources, or complex computations in order to determine the response for a client. Our "one thing at a time" model does not scale well to multiple clients. Against one of the earlier servers, this client will run in a few seconds (but will not capitalize the returned string, of course); a version without the threading overhead will be even faster against the earlier servers. Assuming our hypothetical server process is not purely CPU-bound, we should be able to be much more responsive than 100+ seconds. Notice also that the threads are not generally serviced in the same order they are created in. The way we have set up the "lengthy action" server, we guarantee that it takes at least five seconds to service any given client request. But there is no reason that multiple threads cannot be running during those same five seconds. Again, clearly a CPU bound process is not going to be faster through threading, but more often in a real server, those five seconds are spent doing something like a database query against another machine. In other words, we should be able to parallelize serving the several client threads. On my test system (using localhost, as before), this brings the client runtime down to about 9 seconds--five of those spent in the call to sleep() , the rest with threading and connection overhead (roughly). On Unix-like systems, forking is even easier than threading. While processes are nominally "heavier" than threads; on popular Posix systems like Linux, FreeBSD, and Darwin, process creation is still quite efficient. On my Mac OSX test system, I actually found this forking version a couple seconds faster than the threaded server; to my mild surprise. As a slight difference in behavior, after servicing a collection of client threads, the main process in the while loop winds up as a background process, even if the server was launched in the foreground. In the usual case where you launch the server in the background, the difference is irrelevant though. Another technique called asynchronous or non-blocking sockets is potentially even more efficient than are threading or forking approaches. The concept behind asynchronous programming is to keep execution within a single thread, but poll each open socket to see if it has more data waiting to be read or written. However, non-blocking sockets are really only useful for I/O bound processes--the simulation of a CPU-bound server that we created using sleep() sort of misses the point. Moreover, non-blocking sockets make a bit more sense for TCP connections than for UDP ones, since the former retain an open connection than may still have pending data. In overview, the structure of an asynchronous peer (client or server) is a polling loop--usually using the function select() or some higher-level wrapper to it such as Python's asyncore . At each pass through the loop, you check all the open sockets to see which ones are currently readable and which ones currently writeable. This is quick to check, and you can simply ignore any sockets that are not currently ready for I/O actions. This style of socket programming avoids any overhead associated with threads or processes. We need a "traditional" TCP server to test our slow client against. In essence, the below is identical to the second (low-level) Python server presented in the first part of this tutorial. The only real difference is that the maximum connections are increased to twenty. As with the UDP stress-test client, the threads do not necessarily connect in the order they are launched. Most significantly, however, is to notice that the time it takes to serve all twenty threads is basically the same as the sum of all the introduced delays in writing bytes over the sockets. Nothing is parallelized here, since we need to wait for each individual socket connection to complete. This server is fragile in that it always waits for exactly 20 client connections before select() 's among them. But we still demonstrate the basic concept of using a tight polling loop, and reading/writing only when data is available on a particular socket. The return values of select() is a tuple of lists of sockets that are readable, writeable, and in error, respectively. Each of these types are handled within the loop, as needed. Using this asynchronous server, by the way, lets the "slow connection" client complete all 20 connections in about 6 seconds, rather than 37 seconds (at least on my test system). The examples presented for more scaleable servers have all used Python. In truth, the quality of Python's libraries mean that these will not be significantly slower than analogous servers written in C. And for this tutorial, relative brevity of presentation is important. In presenting the above Python servers, I have stuck to relatively low-level facilities within Python. Some of the higher-level modules like asyncore or SocketServer --or even threading rather than thread --might provide more "Pythonic" techniques. These low-level facilities I utilized, however, remain quite close in structure to the ways you would program the same things in C. Python's dynamic typing and concise syntax still save quite a few lines, but a C programmer should be able to use my examples as outlines for similar C servers. The server and client presented in this tutorial are simple, but they show everything essential to writing UDP sockets applications in C and in Python. A more sophisticated client or server is, at heart, just one that transmits more interesting data back and forth; the sockets-level code is not much different for these. The general outlines of performing threading, forking, and asynchronous socket handling are similarly applicable to more advanced servers. Your servers and clients themselves are likely to do more, but your strategies towards scalability will always be one of these three approaches (or a combination of them).